Anyone who plays video games on a regular basis has probably looked up a stream or two of someone else playing that same game. Perhaps you wanted to see the reaction of others, how others would tackle the problems, or maybe just see what the game is like before you buy it. If YouTube is not your avenue for such events, then most likely you would know of Twitch.tv. For those of you who do not know, Twitch is a live streaming video platform owned by Twitch Interactive, a division of Amazon.com Inc. Introduced in June of 2011, its primary focus revolves around video games, where you can watch let's plays, broadcasts of esports competitions, and creative content as of late. For some, it would be a fantastic avenue to make some friends. For others, it's a great avenue to be able to get your name out there in the community that is gaming. Maybe you want to play a game..? Popularized by the onset of Twitch Plays Pokemon, the Twitch Plays ___ type of games have taken the internet by storm in regards to what the community can and cannot do. Starting as a social experiment, the community of Twitch decided to try and play Game Freak's Pokemon video games by parsing commands sent by users through the channel's chat room. Just imagine that you're in a crowd of 1000 people including yourself. At its core, you would be shouting what input the main character should be doing. Maybe they should go up, or to the right. The person next to you is shouting for them to go down. The person behind you is shouting to go left. The person in front of you is shouting "start9". All the while, you have the main character confused by everyone yelling at them so they take EVERY SINGLE ACTION as they get funneled in. And that's how you get the Twitch Plays scene for normal playthroughs. At its prime, there was a peak simultaneous participation at 121,000 users. So with inputs going in mad, where they determine button presses and directions, you would think that they would never have succeeded. Well, they did. Multiple times. Now this isn't to say that there have only been Twitch Plays Pokemon games. There have been so many others that it has taken the internet by storm in some of the concepts behind them. One of my all time favorite games is Dark Souls, known for its excruciatingly high difficulty curve, and for being incredibly difficult as well. To me, the whole Twitch Plays ___ series is an incredible social experiment to see if the masses can band together to conquer overwhelming odds. They can beat tremendously difficult games, or those that take a lot of skill. It's all mind boggling to say the least. 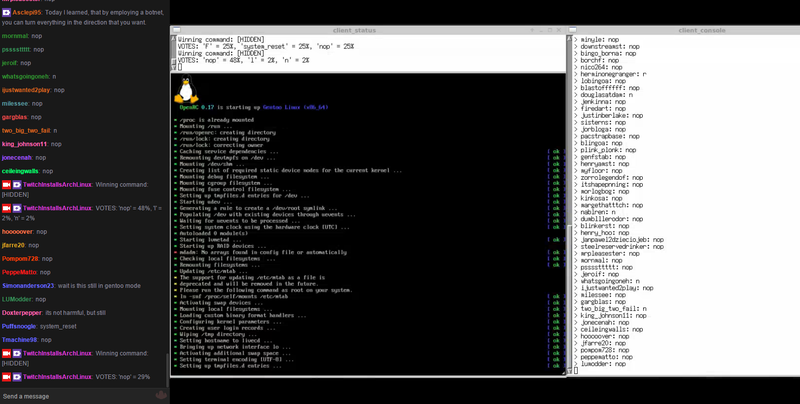 But maybe you're not interested in video games, but perhaps you want to see an Arch Linux installation? Whatever you're interested in, if you want to have a good laugh while watching some crazy shenanigans, I'd check them out!